The explosive power of a nuclear fission weapon is derived from the rapid fission of a large number of atoms at the core of the warhead. Nuclear fission releases far more energy than a conventional reaction. A nuclear chain reaction is one in which one reaction event produces products that initiate more reaction events. If each reaction produces more reactions in its wake, the entire process grows exponentially, with each passing second resulting in a larger and larger number of reactions. The primary difficulty in designing a nuclear weapon is keeping the fission reaction from ending too quickly. When a lump of fissile matter becomes critical, it starts a self-sustaining nuclear reaction. Usually, this causes the sample to melt or vaporize and expand. This process tends to cause the sample to start radiating energy, but not quickly enough to cause a massive explosion. This phenomenon is known as a criticality excursion. 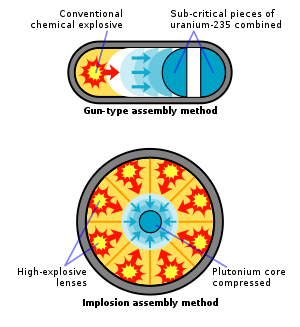 The trick to a nuclear weapon is in holding a sample of fissile material close together for long enough for it to actually cause an exponentially growing cascade of fissions. By the time the sample disintegrates and separates, massive quantities of energy should already have been produced. More powerful bombs not only use more fissile material but also use more complicated designs to hold them together for longer and under tighter conditions so that the maximum amount of energy can be extracted before the entire contraption explodes. It is this delicate requirement that complicates the construction of a nuclear weapon. One early design to keep fissile weapons took the approach of slamming two pieces of U-238 together. A critical piece of uranium rapidly generates heat, melts and separates. But if you take that same critical sample and slice it into two sub-critical samples, you can then slam the two of them together. The force from slamming them together will hold them together for just long enough to cause enough fissions to cause a nuclear explosion. Of course, when I say slam, what I actually mean is put one piece in a gun and shoot it at the other. The solution to the problem of building a nuclear bomb turned out to be “more dakka“. This weapon design is, unsurprisingly, known as a gun-type assembly. Two sub-critical fragments of uranium are mounted on either ends of a long tube/barrel. A conventional explosive is mounted at one end. When the explosive is set off, one of the pieces is sent hurtling down the barrel, accelerating to extremely high speeds. By the time it gets to the other side of the barrel, even though the configuration is critical, the force from the explosive forces the fragments together, setting of a nuclear chain reaction. The timescale involved in exceedingly small – microseconds or shorter. But that is what it takes. Within microseconds, the entire device explodes. The actual efficiency of this device is quite low. A lot of uranium ends up getting scattered in the process without undergoing any fission at all. Nevertheless, the design is relatively simple and its efficacy with demonstrated over Hiroshima, Japan at the end of the second world war. As you may have realized, gun-style nuclear bombs require the fragments to be travelling really rapidly to come together quickly enough to cause a nuclear explosion. If the fragments do not get together fast enough, there is a risk that a nuclear reaction will start too early, causing the fragments to explode without having released much of its nuclear power in a nuclear fizzle, leaving a lot of radioactive waste behind. Designing explosives to accelerate fissile fragments without exploding the barrel of the bomb or adversely affecting the fragment is a tough challenge. It is also dangerous because an accident that triggers the conventional explosive could cause a nuclear explosion, or criticality excursion harming a lot of people and leaving behind a hard to clean mess. A new design was invented that involved only one piece of fissile material instead of two. A single spherical plutonium core, if compressed quickly and really hard, would form a very dense smaller sphere which would be super-critical. This dense sphere would then undergo lots of nuclear fissions to release the desired energy. This design was much safer because it is extremely hard to accidentally compress a plutonium core (without destroying and scattering it) to the point where it is critical. In fact, it was extremely hard to do so even deliberately. Any asymmetric explosion would simply fragment the core. A complicated set-up involving a cocoon of explosives that burned at various speeds was used to create an explosive lens. This lens created a spherically symmetric explosive wave and would compress the core from all sides. All the explosives involved would need to be detonated in a perfectly synchronized manner. If any one of them exploded too early or too late, the wave would not be spherical and the core would simply be ripped to shreds. If all went well, the core would instead be compressed into a tiny critical sphere and be held there for the microseconds it took to fission a large number of its atoms. This type of device is known as an implosion-type assembly. 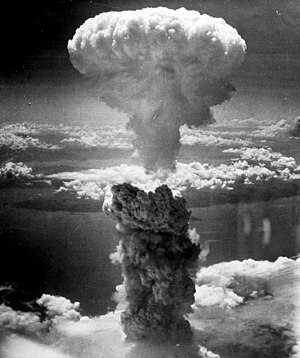 The result is a massive explosion, such as the one over Nagasaki, Japan at the end of the WW2. This is the basic principle behind designing nuclear explosives. Get fissile material that is currently non-critical to become critical and keep it critical for long enough for a lot of fission reactions to take place. As always, easier said than done. I have got 1 suggestion for your webpage. It looks like right now there are a couple of cascading stylesheet problems when opening a selection of webpages in google chrome and safari. It is running fine in internet explorer. Probably you can double check that. Have you considered including a few social bookmarking buttons to these blogs. At the very least for myspace. I adore this site layout ! How was it made? Its rather good! Nice post ! Thanks for, visiting my blog page dude! Ill message you some time. I didnt realise that. After I open up your Rss feed it appears to be a lot of nonsense, is the problem on my part? How do you make this blog look this sick! Email me if you want and share your wisdom. Id be thankful. Do youve a spam concern on this site; I also am a blogger, and I was wondering your situation; weve got created some good strategies and we are looking to trade solutions with other people, be sure to blast me an e-mail if interested. Is it fine to place part of this on my web site if perhaps I submit a reference to this site? Could you message me with a few pointers about how you made your site look this awesome , Id appreciate it! Nice post . Thanks for, commenting on this blog man! I shall email you some time. I didnt realise that. I have got one idea for your site. It looks like right now there are a handful of cascading stylesheet issues while launching a selection of web pages within google chrome and internet explorer. It is working alright in internet explorer. Perhaps you can double check this. Do you might have a spam concern on this web site; I also am a blogger, and I was wondering your scenario; we now have created some good approaches and were looking to exchange solutions with other folks, be sure to fire me an e-mail if planning to pursue. Weird , your post shows up with a black hue to it, what color is the primary color on your web-site? Jesus Christ theres a great deal of spammy feedback on this website. Have you actually believed about attempting to get rid of them or installing a plugin? Have you given any kind of thought at all with converting your current webpage into German? I know a couple of translaters right here that will would certainly help you do it for free if you wanna get in touch with me personally. Is it okay to place part of this on my personal web site if I publish a reference point to this web-site? Oh man. This blog is cool. How did you make it look this good ! Hey, I just hopped over to your website via StumbleUpon. Not somthing I might typically browse, but I appreciated your thoughts none the less. Thanks for creating some thing worthy of browsing. Can you message me with a few pointers on how you made this website look this good, I would appreciate it. Hey, I just hopped over to your web site thru StumbleUpon. Not somthing I might usually browse, but I liked your views none the less. Thanks for creating some thing worthy of browsing. Odd , your post shows up with a black color to it, what color is the primary color on your web site? I like the site layout . How do you make it!? It is rather nice! Have you given any consideration at all with converting your main blog into German? I know a few of translaters right here which would certainly help you do it for no cost if you want to contact me. Nice post . Thank you for, writing on my blog page man. I shall email you again! I did not know that! I tried looking at your web site on my mobile phone and the page layout does not seem to be right. Might want to check it out on WAP as well as it seems most cellphone layouts are not really working with your web page. Whenever I initially left a comment I clicked on the Notify me whenever new comments are added checkbox and now each time a remark is added I get 4 emails with the same comment. Although I actually like this publish, I believe there was an spelling error shut to the finish with the third paragraph. This blog has got lots of really helpful info on it! Thank you for sharing it with me! Can you message me with a few tips about how you made your site look this awesome , I would be appreciative. How did you make a blog site look this good. Email me if you get the chance and share your wisdom. Id be thankful. I Am Going To have to return again when my course load lets up – nevertheless I am taking your Rss feed so i can read your internet site offline. Thanks. I adore the website layout ! How was it made!? Its rather sweet! breakfast due to the fact that I discovered it for him.
! But yeah, thanks for spending time to talk about this matter here on your blog.